There's just something romantic about fall, the cool breezes, the changing colors of leaves on the trees, the shorter days, all make for a peaceful and romantic setting after the hustle and bustle of summer. Beginning of autumn coincides with beginning of the Iranian month of "Mehr" (meaning kindness, love and affection), and in Iran this change of season has been celebrated for centuries with the fall festival of Mehregan. 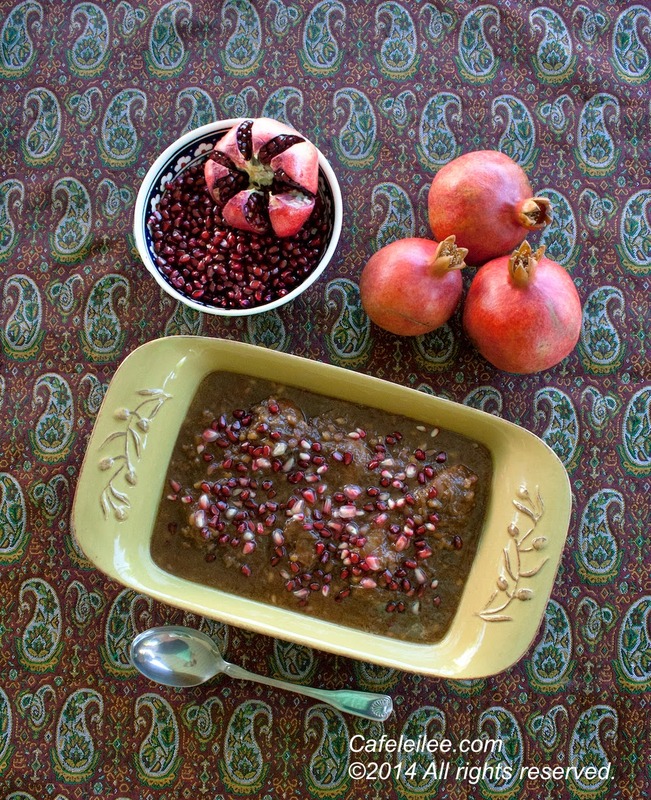 I've always been in love with this season, and this year, I'm exceptionally happy about fall, because along with almost 30 other amazing Persian food bloggers across the world we will be sharing a recipe round up for Mehregan. If you are a regular to Cafe Leilee, you know that we had a recipe round up for Nowruz, and this time our group is bigger and even more fabulous. For a list of participating bloggers and their Mehregan recipes refer to the bottom of this post, you can also follow hashtag #Mehregan2014 on social media for more behind the scene photos and recipes. Heat 2 tablespoons of vegetable oil in a large pan over medium-high heat and brown the chicken pieces on all sides, about 6 to 8 minutes. Remove chicken from the pan and set aside. Put the pan over heat again and add the remaining 2 tablespoons of oil. Add sliced onions and cook until brown, about 10 minutes. Add garlic and saute for another minute. Add the chicken pieces back to the pan. Add pomegranate paste (if using thick pomegranate paste, dilute the paste in 1/2 cup of water before adding), pomegranate seeds, salt and pepper. Cover the pan, reduce the heat to a low simmer for about 45 minutes, until chicken is fully cooked. 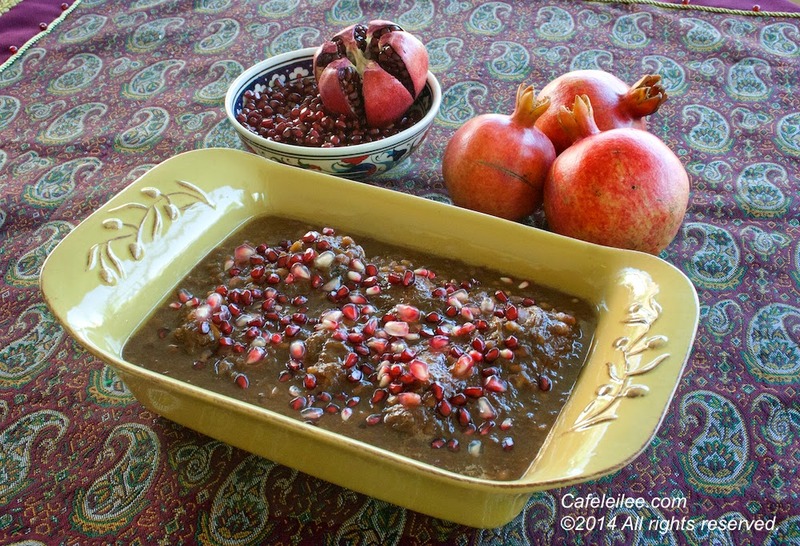 Garnish with some pomegranate seeds before serving and enjoy with some Persian rice. پاییز, مخصوصا ماه مهر همیشه محبوبترین فصل من بود. اولا که تولدم توی ماه مهر هست, بعدش هم با اینکه زیاد از درس خوندن خوشم نمیومد ولی حال و هوای مدرسه رفتن یک جورایی میچسبید, مخصوصا وقتی که تلویزیون آهنگ همشاگردی سلام رو پخش میکرد. توی شمال زندگی کردن, پاییز یک حال و هوای خاصی داشت, شروع پاییز معنیش رهایی از هوای گرم و رطوبتی بود و آغاز روزهای بارونی و صدای خش خش برگهای نارنجی زیر پا موقع رفتن به مدرسه. خلاصه یک چیز خاص و رومانتیکی در باره پاییز هست که به آدم آرامش خاصی میده. امسال من این تغیر فصل رو به خصوص یک جور دیگه دوست دارم, چون همراه حدود ٣٠ بلاگر هنرمند دیگه در سراسر دنیا به مناسبت مهرگان دستورهای پائیزی خودمون رو همزمان منتشر میکنیم. برای دیدن لیست این بلاگ ها به لیست بالا رجوع کنید. ماه مهر, ماه مهربان بر شما مبارک. مرغ را با دوقاشق روغن مایع توی تابه روی حرارت متوسط تا زیاد سرخ کنید, حدود ٦ تا ٨ دقیقه. مرغ را از تابه خارج کنید و کنار بگذارید. باقی روغن را توی تابه بریزید و پیاز را در تابه سرخ کنید, حدود ١٠ دقیقه. سیر را اضافه کنید و حدود یک دقیقه دیگر تفت دهید. مرغ را به تابه برگردانید. رب انار (اگر از رب انار محلی استفاده میکنید, رب را در نیم پیمانه آب حل کنید), دونه انار و نمک و فلفل را اضافه کنید. حرارت را کم کنید, در تابه را بگذارید و بگذارید خورش برای ٤٥ دقیقه جا بیفتد. I'm always amazed by all of the Persian stews that I have never heard about. I must try this one soon. Thanks for sharing! This looks awesome, I've never had this there are so many dishes in this round up I have to make. Just in time for Anar season! This looks very appetizing. Different from the version I knew as is expected of Persian cuisines. I will sure try this. Happy Mehregan! I love seeing northern Iran represented!!! This looks fantastic. khoreshte anar sounds amazing! and with garlic! yum! Leilee Joon, this is so beautiful! I love the combo of the garlic and anar as well! Leilee joon, this sounds so delicious and presents beautifully. I will put it on the menu for the w/end. Gorgeous dish! I have never heard of it either but will by trying it. I'm allergic to walnuts and I mourn the fact that I can't eat fesenjoon anymore - this seems like it will satisfy that need. Beautifully told and photographed, Leilee joon. Leilee jan, love this recipe, it's a must try! Thanks for sharing. Dear Leilee, my fathers family hails from Gilan. This stew looks great and I can't wait to try it. A great and less time consuming alternative to Fesenjan. I can't wait to try your recipe! Leiliee jan merci for sharing this mazandarani dish, looks and sounds delicious. Hello Leilee jan, It is only recently that I am being introduced to variety of dishes from Mazandaran. Pomegranate and garlic... it must be fabulous. Belated Happy Mehregan! :) Fae. I tried this yesterday and it turned out super delicious. Thank you and do please share more shomali recipes.